From Pioneers (Northern Territory) and Eastern Under-18s. A classy left footer who was given a consistent run in the seniors in mid-2002. A highly polished footballer who moved to Melbourne as a youngster and was looked after by his guardian Beverley Knight, an Essendon board member. 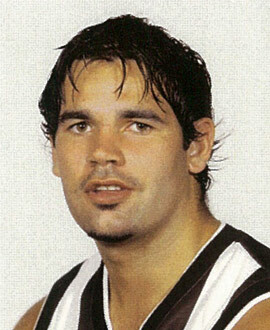 He was drafted by Collingwood and became a regular in defence in the second half of 2003. He had a disappointing Grand Final, but in 2004 his efforts in defence were a highlight of an otherwise low-key year for the Magpies. His confidence built every week and he came seventh in the best and fairest. But 2005 was less than satisfactory and he was traded to Essendon. He missed the first half of the season with a knee injury and did not get a senior game until Round 17. He did not have an impact in his four games.